We went through decisions, trials, and tribulations that married people would go through after having been together for at least 10 years. We started 2016 moving from one hotel to another because we lived near the Aliso Canyon, where the methane gas leak made our area uninhabitable. The process of reimbursements and collecting other miscellaneous and cleaning fees gave an added financial strain, especially since SoCal Gas refused to acknowledge some of the legitimate expenses. We also lost loved ones who have been strong maternal figures in our lives. Career-wise, Kira decided to explore nonprofit alternatives but came to a dead end after her (still valid but expiring) visa did not meet the job requirement. In terms of wellness, the year wasn’t our healthiest but gratefully, Ray was able to evade the big C by undergoing the necessary procedure. From an immigration perspective, the current political landscape, a product of the 2016 election results, creates uncertainty for 2017 and beyond. In a way, we’re glad we ourselves already went through the petition and spouse visa processes, but at the same time we struggle with the prospect of the multitude of challenges and complexities that new immigrants may face. It’s tough to think that no matter how open and thorough one’s application is, that it may be unnecessarily scrutinized. In light of these fears and concerns with immigration, the strength of the democratic process and the built-in system of checks and balances among the three branches of the U.S. government will all truly be tested. 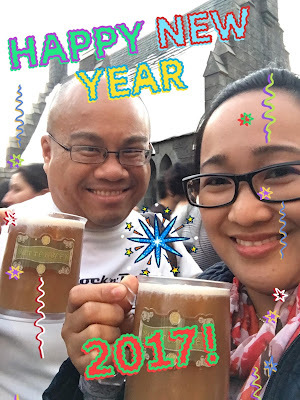 So when the 2016 ended, we welcomed 2017, along with the new leaf of possibilities. We can hope for an untroubled, uncomplicated, and bad news-free year but we know that this is too utopian. Instead, it is with much optimism that we look forward to a year of turning unpleasant experiences into lessons that we can share to our readers.